This is going to be a little backward. On Thanksgiving Day I ran 2 races. 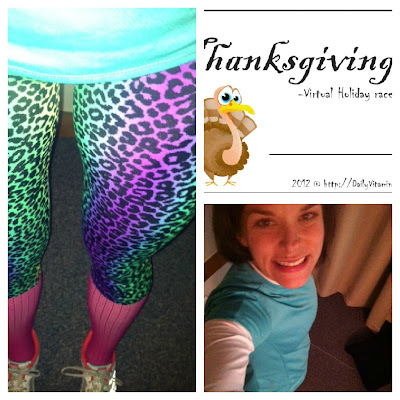 One official 5k in the morning (post coming tomorrow) and then an after dinner "virtual" race with the husband. I was completed wiped out after running the 5k in the morning and had just about decided I was not going to get in my 2nd run of the day until Ward woke up from his nap - yes, lucky him, and he asked "wanna go for a run" and my response was "okay". He completely twisted my arm. Can't you tell? We were still at my in-laws house and the kids were having fun with their grandparents, so this was also a date run and my virtual race for Kiley at Daily Vitamin F's Thanksgiving Race. We don't get many of those. It was absolutely freezing and the capris I had packed weren't going to cut it, so I decided to wear my compression socks on the run. Ward and I ran around Brunswick and Topsham and had a great time talking. Something we don't get to do a lot of either with his crazy work schedule lately. We even found a new little paved path in Topsham. Even in the dark we knew it was a great little place. Maybe someday we'll return there in the daylight. We also ran across a little foot bridge. 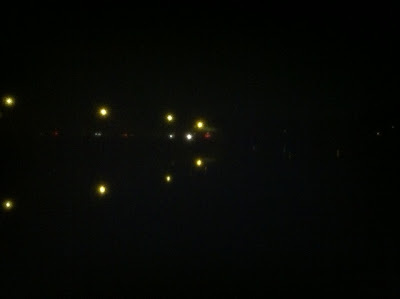 It was so cool running over the river at night and seeing the lights of the fort and the town from where we were. I tried to take a picture, but it didn't come out very well. In all, our date night run was 6 miles in 50:54 and full of incredible conversations with my husband. So pleased you got in a nice run with your husband. I can just barely talk when I WALK with mine. Uninterrupted conversation is just rare, isn't it. Those tights - I love! Amazing that you got two runs in Thanksgiving. Cannot wait to be up and running again. I did walk a 5K though and at least that was some exercise. P.S.- You tights are fabulous! I am so in love with those capris, I love them more everytime I see them. Maybe they will be a birthday present to myself :) Great job with two runs! What a fun run together! Allan and I ran together too but that was really me running in front and him following me while he listened to his music.